UCLA Architecture and Urban Design's end of the year all-school exposition between two campuses at Perloff Hall and the IDEAS campus engages students, faculty, and the international design community in a discourse on the forefront of contemporary design and innovation. With 20,000 square feet of studio and program installations, 240 projects on view and 90 leading critics and practitioners, RUMBLE redefines the provocative opportunities confronting the next generation of architects. An image search for the Farnsworth house on Google reveals a proliferation of copies. This weekend house commissioned by Dr. Edith Farnsworth and designed by Mies Van der Rohe is sited on a flood plain in Plano, IL. Designed in 1945, exhibited at MOMA in 1947, constructed in 1951, restored in 1972, 1996, and 2008, the project is, in fact, a series of material and digital reproductions. Among these copies are tagged snapshots (the products of architectural tourism,) commissioned photographs (copyright held by the National Trust,) screenshots of SketchUp models, orthographic and detail drawings, texts and other reproductions including models sold by Lego. And we must not overlook other forms of copy-like those collected in the 372 search results on Amazon. The Farnsworth house epitomizes the uncontainable dissemination of the copy. Ctrl C is at our fingertips allowing techniques of sampling, appropriation, collage, and reference to shape our thoughts and work. In architectural production, the copy alters the conditions of dis/order, the construction of images, and challenges our faculties of discrimination. A collective fascination with the copy signals a contemporary lack of concern with originality, authenticity, ideology, and autonomy. Disciplinary self-reference is replaced by quotation, curation, and assemblage. Ctrl C panelists will present and discuss the role of the copy in their work. Panelists include Noa P. Kaplan, Erin Besler, Andrew Kovacs, Clark Thenhaus, John May, and Heather Roberge. Join us for the presentation of student awards and view 10,000 square feet of student work followed by a DJ party with tacos and drinks. UCLA Architecture and Urban Design would like to thank our presenting sponsor: Shelter Co., Ltd.; sponsors: Coolhaus, Red Bull, Tierney R. Tupac, Behr, and Kilz. 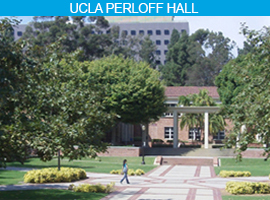 RUMBLE takes place in Perloff Hall on the UCLA campus and at the IDEAS campus in Culver City. Parking is available on the street. IDEAS parking lot closed for party.